She's Fantastic: Amanda Conner - SUPERHERO HARLEY QUINN! Amanda Conner - SUPERHERO HARLEY QUINN! 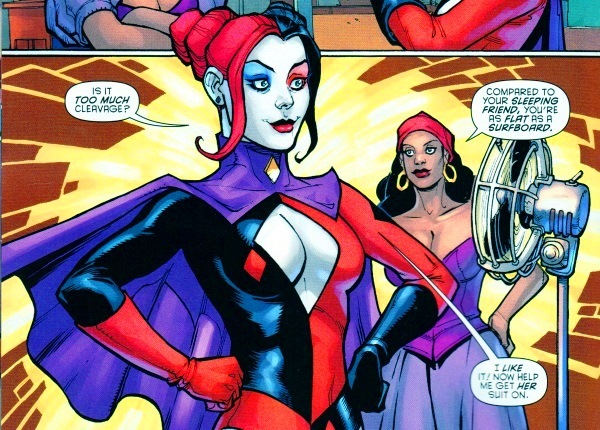 Harley Quinn has had a lot of costume designs in recent years. Video games were the biggest catalyst for the changes and most of them seemed like awkward misinterpretations of the character rather than a true evolution. 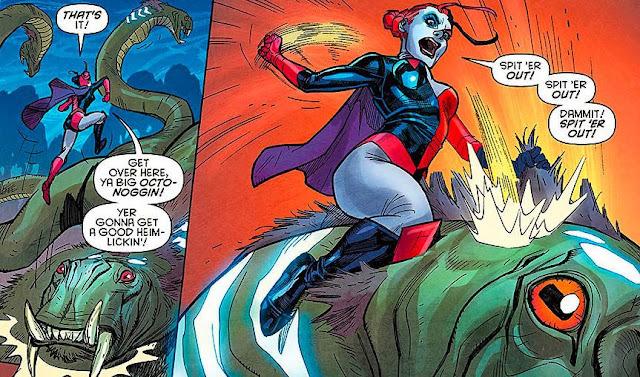 The Roller Girl revamp of 2014 was the first time a Harley redesign felt right for me. It wasn't too long before the movie version became canon and now she seems to alter her looks quite often (and I'm mostly okay with it). Squeezed into those early post-rollergirl changes was this Superhero costume which she donned in order to team up with a brainwashed Power Girl, convincing PG that she was her trusty sidekick to enjoy all the perks of superheroics. It was a fun storyline that eventually spun off into its own title Harley Quinn and Power Girl (which only lasted for six issues, but was great). This figure is one of those gems I never expected to see but makes a really quirky addition to an already insanely-quirky Harley collection. She's my favorite of this series. Let's check out Superhero Harley below! Harley comes with a giant rubbery anime-style crying head. You can actually fill it with water and make her shower tears all over your other toys. Here she is with the most recent Power Girl figure. It's a shame they look right together. And with the rest of this wave: Spacesuit Harley, Traditional Harley, Santa Harley, and Superhero Harley. And from my perspective, I like her, but I think she's getting too many figures. I think she's probably surpassed Catwoman as the second most merchandised heroine which doesn't seem right considering her relatively short history.